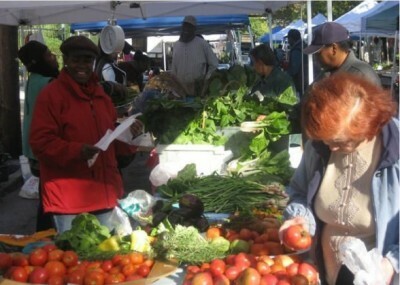 Browse: Home /	Food, URBAN FARM & GARDEN / East New York Farmers Market celebrates 10 years! East New York Farms! is a community-based program that brings together neighborhood gardeners, local entrepreneurs, youth leaders, and regional farmers to create a vibrant public market in East New York, Brooklyn. The ENY Farmers’ Market is the oldest of a growing number of markets in NYC that work closely with community gardeners as micro-entrepreneurs. The project also engages 24 local youth in its Urban Agriculture Internship. Youth cultivate their own ½ urban farm, assist local market gardeners, and partner with adults in the community to run a seasonal farmers’ market. Since 1998 our market has generated over $630,000 of income for local gardeners and vendors and regional family farmers. More than 50 local gardeners have grown over 60,000 pounds of fresh organic food right in East New York. Over 80 young people have participated in paid internships offering agricultural training, leadership development, and social justice education. Over the years the market has expanded its role in the East New York community. Beginning as a source of fresh produce, it has grown to be a center for education, collaboration, and neighborhood pride. The ENY Farmers’ Market will celebrate its 10th Anniversary with a street fair on New Lots Avenue, between Hendrix and Jerome Streets, on Saturday September 20th, 9 am – 5pm. The Anniversary Celebration will feature live performances by local groups including Lyrical Artist, the Gowanus Wildcats, Non-P and other artists with the Elevation 2 New Heights label. Other attractions like free ice cream from Ronnybrook Dairy Farm, face painting, a cooking contest (with prizes! ), a storytelling and crafts station, health screenings, and raffles & giveaways will make for a full day of fun for the whole family. Help celebrate 10 years of community-led change. Stop by on Saturday September 20th, or any Saturday through November 15 at New Lots and Schenck. Regular market hours are 9:00am to 3:00pm. I wish I could go, but I’ll be in the park foraging with Steve Brill! I would like to thank everyone who came out to the farmers market in September and the staff who made it possible for my company and my other artist to perform.